In this recipe, apricot jam is the base for a sweet and spicy glaze with which you cover the pork chops. 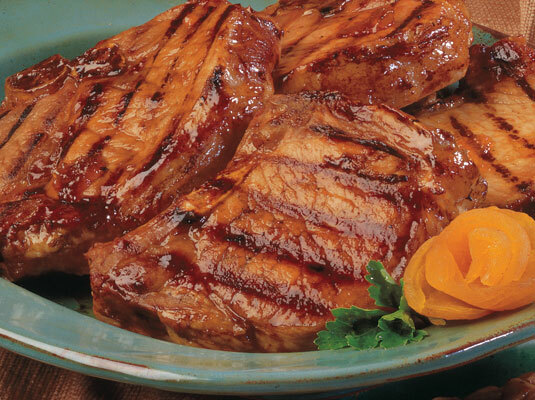 These apricot-glazed pork chops are a wonderfully flavorful grilled main dish. Prepare a medium-hot fire in a charcoal or gas grill. In a small saucepan, combine the jam and vinegar. Cook, stirring over low heat, until the jam melts. Stir in 2 teaspoons ginger, the garlic, soy sauce, and cayenne pepper. Remove from the heat and set the glaze aside. Trim all but 1/4 inch of fat from each pork chop. Brush the chops lightly with oil; sprinkle with salt and pepper. Place the chops on a well-oiled grill grid. Grill the chops for 3 minutes on each side. Brush both sides generously with the glaze and grill for another 4 to 5 minutes or until done, turning once. The chops are cooked when the meat has a light pink blush and there’s no sign of pink near the bone. Simmer the remaining glaze for 2 to 3 minutes. Drizzle over the grilled chops before serving (if desired).